SHANGHAI, China – Cascades of light, like shimmering waterfalls, tumble down the sides of spiral skyscrapers here in what a friend described as China’s blade runner city. Highways are elevated, lit underneath at night in blacklight blue. A maglev train, the first in the world, speeds at 250 miles per hour to the glass and steel expanse of the international airport, which gathers the train in the folds of its white wings. It’s easy as a westerner raised at the height of the 20th century American empire to get carried away with the spectacle that is China in the 21st. 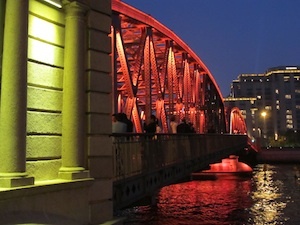 Shanghai’s riverfront Bund is an apt place to start. San Francisco’s Embarcadero or Boston’s Faneuil Hall, or Chicago’s Navy Pier are engaging public spaces, night or day. None, though, is nearly as beautiful, exciting, and well designed as the Bund, the grandest example of public space architecture – matching the urban experience with a natural resource — that I’ve ever seen. Nineteenth century European-built government buildings, lit beautifully to enhance the ornate stone curls and cornices, face towers that reach to the clouds. Between them is the heavy boat traffic of the Huangpu river. A number of the office towers serve as screens for full-color videos and motion graphic displays, so colorful and bright they light the barges and river boats. Tens of thousands of residents and tourists stroll the granite-tiled plaza along a mile of the river’s western shore. At the southern end an 80-year-old steel truss bridge, lit in red, beckons brides and stunning Chinese models and their eager photographers. Chinese, like Americans, gather at the water’s edge. Here, though, the scent in the sea air and the energy in the crowds is different. More hopeful. More confident. More secure. 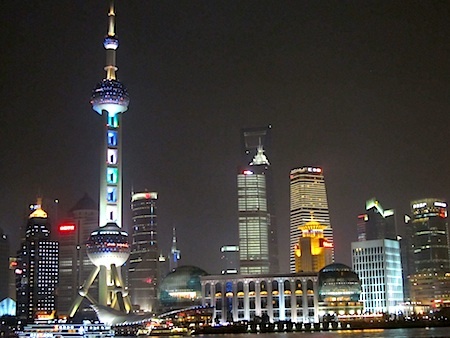 China is a nation that knows where it wants to go. The U.S. is a nation anxious to hold on to where it’s already been. Every American I’ve met in China, most of them young, ambitious, and seeking a place in an economy here that grows 10 percent a year, asks the same questions. Why is the U.S. so stuck? Why haven’t Americans responded to the way China is opening so much new opportunity in so many of its industrial sectors? What is wrong with America? There is no one answer, of course. 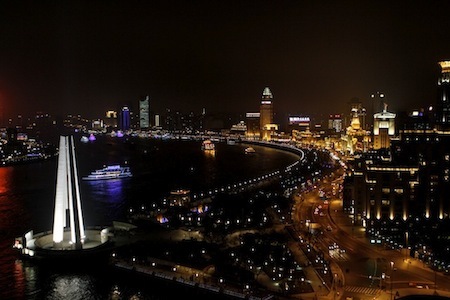 But it’s also perfectly clear that the cultural and economic power displayed at the Bund, (see pix below by J. Carl Ganter) the technological and financial might described by the maglev and the Shanghai airport, portray a nation that is content with America’s diminished stature. China is setting its own fearless course, just like the United States once did.